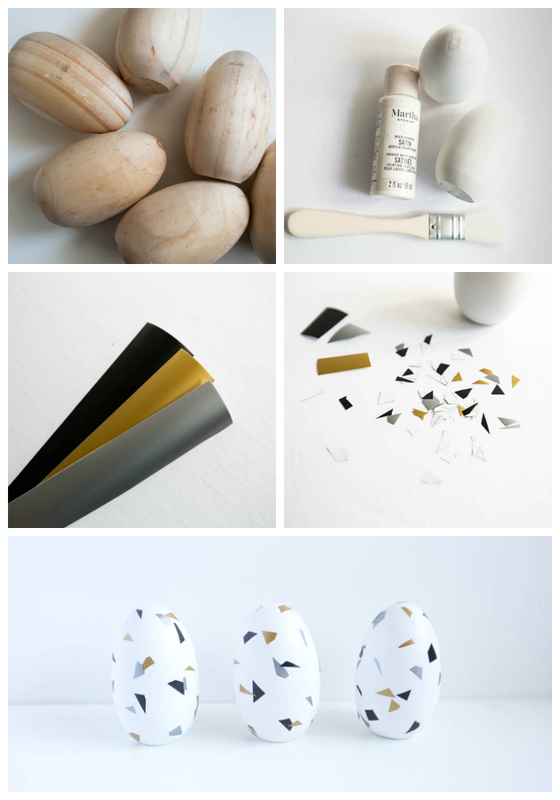 Make DIY Modern Easter Eggs with paint and vinyl. 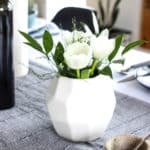 You will love the modern design! Easter is everywhere right now. There are so many bright coloured, rainbow decorations on every store shelf. Yet, I couldn’t find anything I wanted. I actually went looking this year. 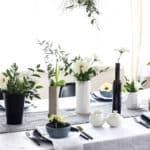 I checked multiple stores for some cute decor that I could put on my table or decorate the living room with, and I couldn’t find anything that I would consider modern or minimalist. Anything I found that fit my usual colour scheme (black, white, wood, repeat!) was either very “farmhousy” or very plain. 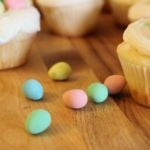 This is when I realized that I haven’t shared any Easter DIYs on the blog. Well… the time has come. Time to ease all of those modern decorators! 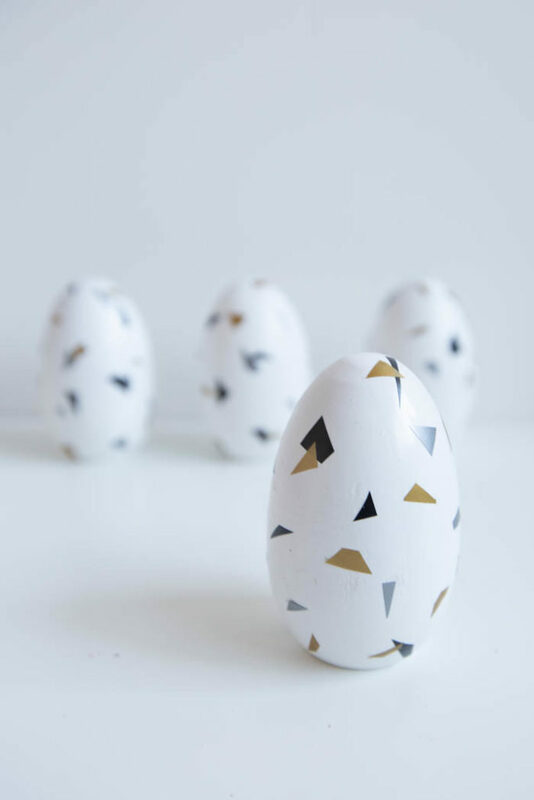 These DIY modern easter eggs will mark my first Easter project on the blog. 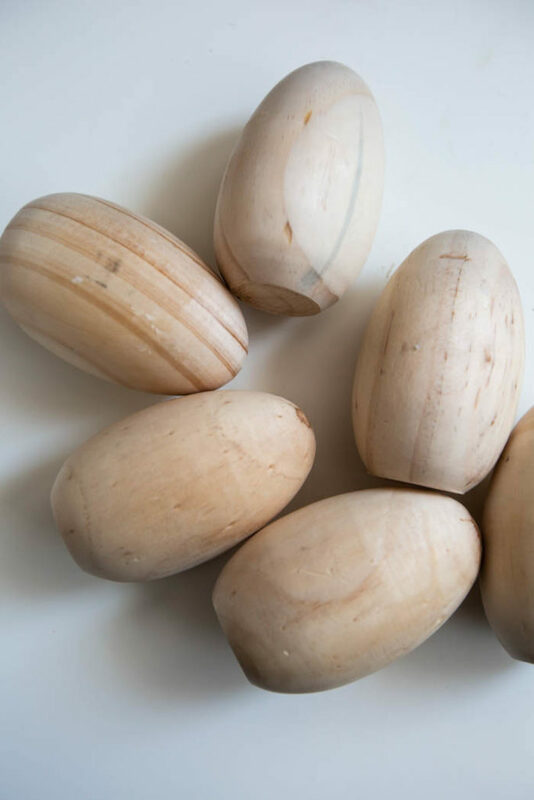 I love these little wooden eggs. I would honestly put these guys out in a bowl, and not even have to redecorate them. I bought a few extras just for that reason! 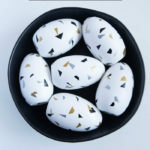 But I really wanted something to fit into my tablescape this year, and wanted to make a unique modern Easter egg. Have you heard the term terrazzo lately? It’s a popular tile type that has chips of material (glass, marble, quartz, etc.) to create a random pattern of shapes and colours in tile. It’s growing in popularity right now and I’m seeing the word pop up more and more often! The tiles are being used more, but decor with terrazzo patterns are also trending – planters, pillows, vases, etc. 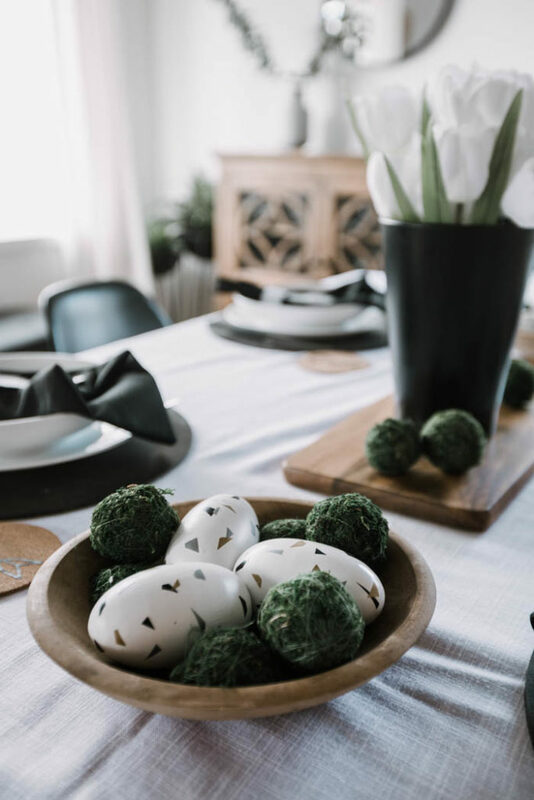 I recently saw a friend make these faux terrazzo projects (a dish and a planter), and I loved the idea of using this pattern to modernize decor. She used a different method than I’m using today for my modern Easter eggs, but both are fun projects. This project could not be easier! 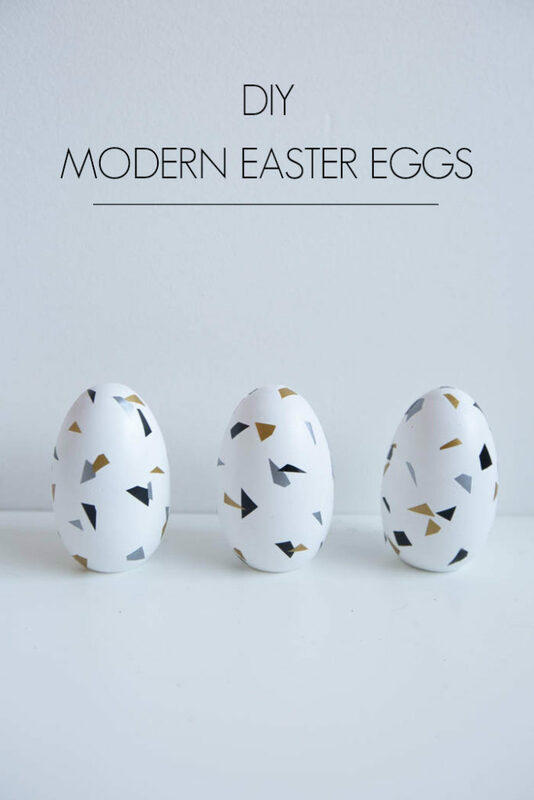 Start by painting your wooden eggs. I chose to paint mine white with Martha Stewart paint because …. you know me: black, white, wood, repeat, lol. But you can make these as vibrant or colourful as you like. Next, choose your vinyl colours. The vinyl I choose came together in a pack of Martha Stewart Cricut vinyl from Michael’s. They sell many other vinyl sets, some in much more traditional spring colours, but I love the metallics in this set. Originally I cut all of my vinyl into tiny pieces with the intention of peeling off the back and sticking it onto the egg. Well, as it turns out, its very annoying to try to peel vinyl off of teensy pieces, lol. So instead, I peeled the back off of a larger piece (so it was just sticky vinyl), and cut off one sticky piece at a time, attaching them to the egg as I cut. Much faster. The pattern can be completely random. I tried to get some pieces close, and overlap others. I also made sure my shapes were all different to add some authenticity. I really loved the final design. It was such a simple design and DIY. It’s chic but still adds an element of fun. My daughters thought I should’ve added purple too, but I let them paint purple on their wooden eggs instead (yet another use for these guys!). 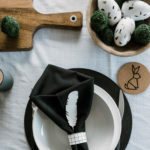 When I started this project, I honestly had no idea what my Easter tablescape was going to look like, but when I finished these eggs I knew they would be a part of it. I collected random decor from around my home and started piecing together the elements until it looked good. 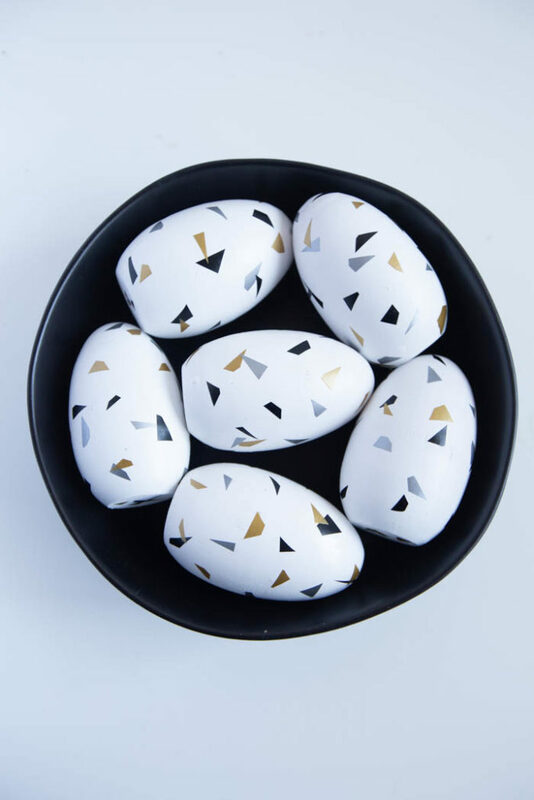 I’ll be sharing the entire Easter Brunch table tomorrow, but for now, here’s a sneak peek at what the eggs look like as part of the modern Easter centerpiece. 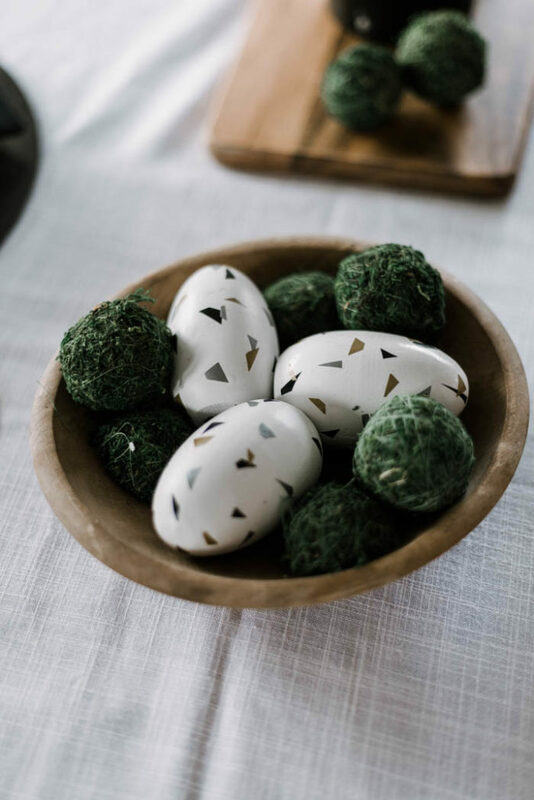 If you aren’t making a big tablescape, but still want to make these beautiful eggs, there are a few other ways that you can decorate with them! Simply put them in a bowl on the coffee table (much like the bowl above!) to make a simple centerpiece. 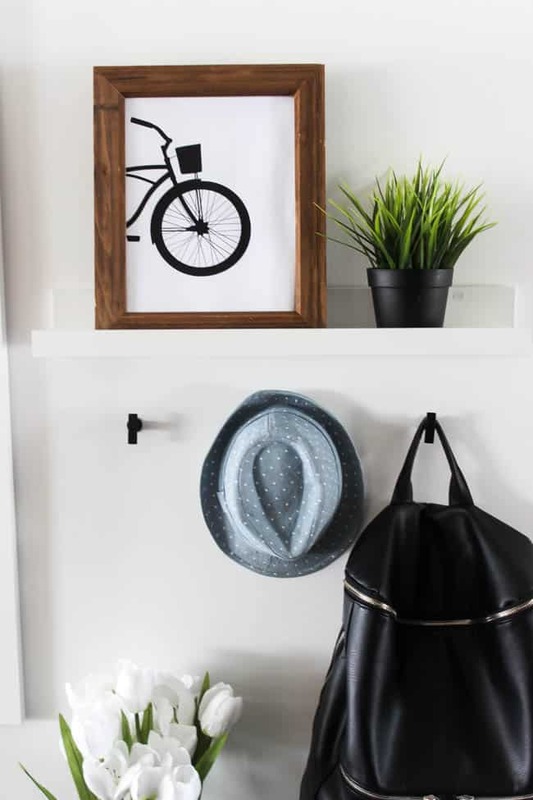 Line them up on some floating shelves to act as decor. 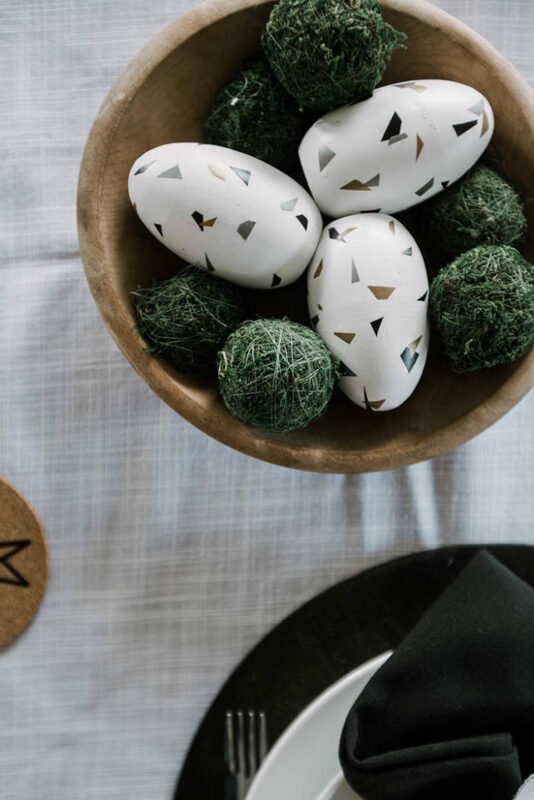 Instead of a full tablescape, just place one pretty egg on each place setting. I love these guys, which means that they are going to come out year after year and I’m sure I’ll be sharing more creative ways to showcase them! If you’re looking for another easy way to decorate for Spring, download these FREE Spring printables! There are four to choose from!